Una bienvenida y un resumen de las actividades del Grupo de Trabajo 1 de la Cost Action Eurospec inician la reunión. Las redes internacionales centradas en la unión de mediciones ópticas y de flujos, Eurospec y SpecNet, se presentan a la audiencia, resumiéndose su evolución, objetivos y estado actual. Además, la red del Sistema Integrado de Observación del Carbono (ICOS) y sus relaciones con Eurospec son también presentadas. Welcome and a summary of activities of the Cost Action Eurospec Working Group 1 start the meeting. 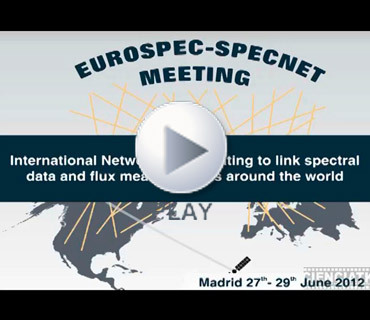 International networks focused on linking optical and eddy flux measurements, Eurospec and SpecNet, are presented to the audience, summarizing their evolution, aims and current state. Moreover, the Integrated Carbon Observation System (ICOS) network and their interactions with Eurospec Cost Action is also introduced. Intervienen: John Gamon, Univ. Alberta; Arnaud Carrara, CEAM.